...and you thought it couldn't get any better. The first high-definition field guide designed for the iPad. Everything you need to make your sightings truly unforgettable. An intuitive search engine cataloguing every detail for 938 species. iBird Ultimate Guide to Birds is the newest, most feature-rich Bird App specifically designed for iOS 7.
iBird 7 Pro Guide to Birds is designed to satisfy the demanding needs of advanced birders and professional naturalists. iBird 7 Lite Guide to Birds is a completely FREE way for you to experience the new, feature-rich iBird Ultimate app. iBird United Kingdom and Ireland Guide to Birds is designed to satisfy the demanding needs of advanced birders and professional naturalists. iBird UK & Ireland Lite Guide to Birds is an interactive guide to 30 bird species of the United Kingdom and Ireland, designed for you to sample the iBird family of apps. Finally, an app designed to showcase the birds of the UK and Ireland in stunning resolution on the iPad. Ready to take birding to a whole new level? iBird Journal is the first sighting app designed to make list-keeping fun, easy and most of all unforgettable. As technology continues to evolve, iBird is working to bring the world of bird spotting and identification to even greater heights. As featured in USA Today, we’re working to seamlessly integrate unprecedented technology into the way identification is achieved in the field. 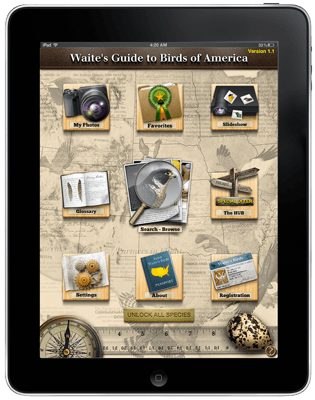 What would it be like to have the power and beauty of Waite’s Guide for Birds of America with you literally everywhere you go? 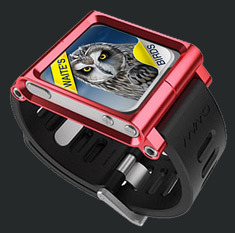 That’s what we’re working to create with Wrist Birds. Never before has such incredible app technology been put in such a mobile and accessible form, and we’re working to see it become a reality. ™ and © 2014 Mitch Waite Group. All rights reserved.